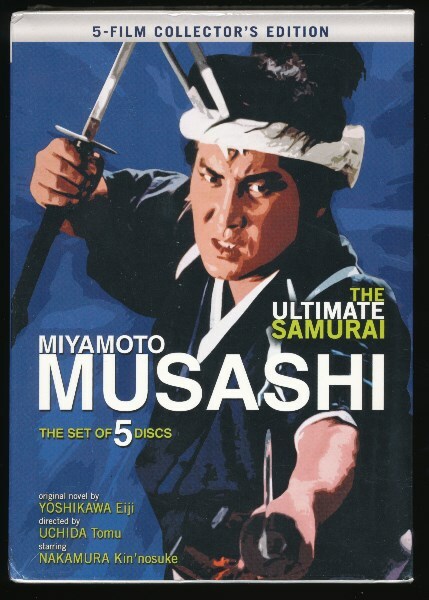 DVD Samurai - Miyamoto Musashi 5-Film Collector’s Kaufen! Internationale Versandkosten: Examples of shipping costs: EU: DHL Parcel 18 EUR; Europe (without EU): DHL Parcel 31 EUR, USA/Canada: DHL Parcel 39 EUR, Rest of the world: DHL Parcel: 48 EUR. Miyamoto Musashi 1961 / 110 min. Duel at Hannya Hill 1962 / 107 min. Duel at Ichijyo-Temple 1964 / 128 min. Duel at Ganryu Island 1965 / 121 min. Käufer zahlt Versandkosten. Deutschland (Porto/Verpackung) Hermes-Paket (versichert) 5 EUR oder DHL-Paket (versichert) 7,50 EUR. Ausland auf Anfrage. Vorauskasse per Überweisung oder Barzahlung bei Abholung. Versand sofort nach Zahlungseingang. Buyer pays actual shipping cost from Germany. Payment by agreement. Payment in advance. Shipping and handling immediately after payment. Examples of shipping costs (not or low insured): EU: Parcel 9 EUR (not insured), EU with tracking number (insured until 50 EUR) 14 EUR; World: Parcel 16 EUR (not insured), World with tracking number (insured until 50 EUR) 22 EUR. Insured DHL parcel until 500 EUR: EU 18 EUR, Europe 31 EUR, USA/Canada 39 EUR, Rest of the World 48 EUR. Please, ask before bidding if you have any questions. Shipping immediately after payment.